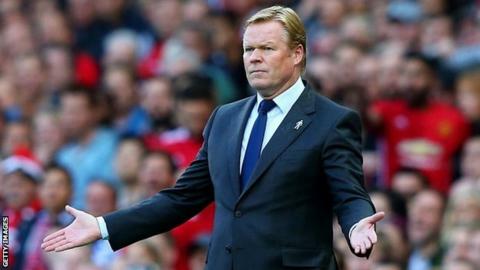 Manager Ronald Koeman says he has the "total support" of the Everton board, despite a poor start to the season. The Toffees spent more than £100m on players last summer, but sit two points above the relegation zone and have two wins from eight Premier League games. Majority shareholder Farhad Moshiri and chairman Bill Kenwright visited the club's Finch Farm training base last week and spoke with Koeman, who guided Everton to seventh in his first season. "We spoke about football," said Koeman. "There was not really a message but the feeling is they are behind the team, they are behind the manager. "Everybody knows in football that's a nice thing but in football always, finally, it's all about results. Until now it's full, total support from the board, yes." Koeman's side, who drew 1-1 at Brighton on Sunday and are 16th in the Premier League, host Lyon in the Europa League on Thursday, but are bottom of Group E and without a win after two games. After Lyon, Everton face Premier League games against Arsenal and Leicester, with a Carabao Cup trip to Chelsea on the Wednesday in between. The Foxes, who sit two points below Everton in the league, sacked manager Craig Shakespeare on Tuesday. "Everybody knows in football the manager's job is a really difficult job because things change really fast," added Koeman. "Most of the time the manager doesn't get time to improve the team. It's football, it's hard to take for the managers but it's part of the job."